This term the students participated in the Start Smart program which is designed to change the way students learn about money. The students of P-2 were introduced to money, what it is used for and how it can be earned and saved. Guided by Captain Super Cents, the students were taught to distinguish between needs and wants and to recognise the dangers posed by Gobbles the Wallet Monster, who represented all those temptations to spend money needlessly. They learnt fun rhymes and tips to help them form solid financial habits. 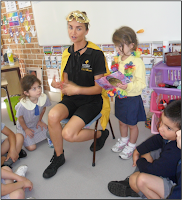 The Year 3/4 workshop taught the students about earning, saving and spending money. The students also leant to recognise the social pressures that make them want to spend money in the first place. Coach Cash - their personal financial trainer, trained them to become elite athletes at managing their finances. Year 5/6 students learnt important financial literacy skills through a range of scenarios that related directly to their daily lives. They were taught about how we can earn money, what it means to earn money responsibly, how to set a budget, what interest is and how to compare prices when shopping. These fun and engaging workshops equipped the students with the confidence and competence to make smart decisions about money.